You must make reservations at least 5 minutes in advance of the time at Sunrise Café at Omni Amelia Island Plantation Resort. Parking garage in addition to two separate flat lots, all close to the hotel. 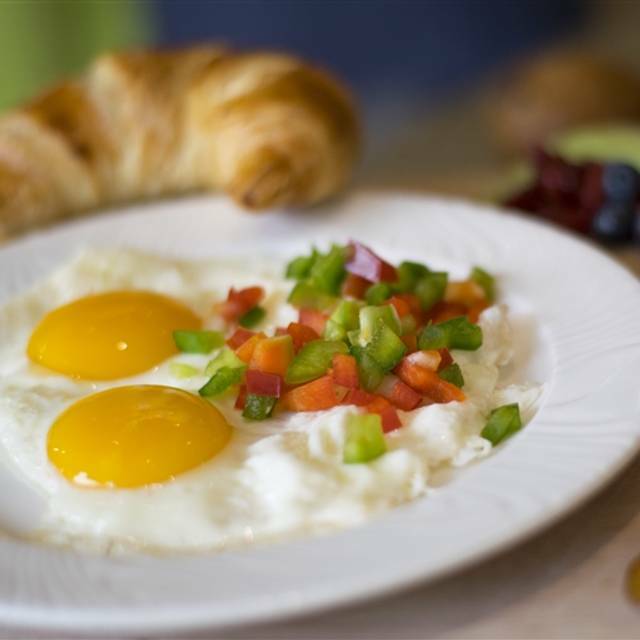 Sunrise Café is the perfect location to enjoy either breakfast with friends and family. Take in unmatched views of the Atlantic Ocean from our outdoor terrace while enjoying menu items that challenge traditional fare. The "Art of Breakfast" features local fruits, fresh baked pastries, organic cereals, made to order cage-free egg omelets and maple-blueberry organic sausage just to name a few. Breakfast is served daily from 6:30-10:30am. whipped cinnamon honey butter, maple syrup, bacon "chips"
Easter brunch. Was very nice but very expensive. Especially having Celiac disease. Not much I could eat and had to pay $64 for buffet. This was our first visit to the Omni Sunrise Cafe, but it won't be our last! Their Easter Brunch was magnificent and the service was perfect. We had a table on the verandah overlooking the ocean and couldn't have been happier with our experience. Of course the endless mimosas and bloody marys didn't hurt either! Great food. Michael our server was wonderful. Great breakfast dining experience. An excellent and picturesque breakfast! The setting, looking over the Atlantic, and the attentive servers made the entire meal a delight. And the food - WOW! Having freshly squeezed OJ with fresh honey (literally dripping from the comb!) were just a couple of the unique and delicious elements to this family resort breakfast. We will definitely be back! Absolutely horrible service and not so great brunch. The food ordered off the menu took over 40 mins to arrive at table. Once arrived, eggs were ice cold, found hairs in the pancakes, and orders were incorrect. Not a fan of the brunch. Didn’t seem to have enough staff members to keep up with the influx of people. Our server Michael L provided outstanding customer service and made us feel amazing! We visited the restaurant 2 days in a row and he knew us by name and remembered what we liked. His spirit and energy made our mornings! The view is stunning and at sunrise it’s the best. The food was delicious and the orange juice was the best we ever had. Ms Donna shrimp omelets were tasty and on her off day the gentleman that work the omelette station heated my cinnamon roll at my request and brought it to my table. The buffet is pricey but tasty and I would pay that amount again and more just to experience the outstanding customer service by Michael any day! Michael we will visit the Omni at Amelia again soon just to visit you and the tasty orange juice of course! A bit pricey, but worth it for the occasional splurge. Go for the buffet, because it includes everything on the menu for only a little bit more than you’d pay for just an omelet. Buffet includes custom-made omelets by Ms. Donnie, who is as seeet as she is gifted at omelet creation. Went for Sunay brunch. Food was plentiful, good variety, and delicious. Service was friendly and efficient. Atmosphere is upscale, but comfortable. Nice view of ocean. Mrs. Donnie is a national treasure. Her omelettes make this place 10 out of 5 in my book. Go here during the weekends and make sure to get a reservation! We did the breakfast buffet and it was top-notch. The food was beyond expectations and the omelet chef was great. The service was spot-on. Also, kids under 5 are free. The food is delicious and all homemade. The eggs are fresh from their chickens. This is my favorite place to have breakfast on Amelia Island. The staff are very polite and efficient. 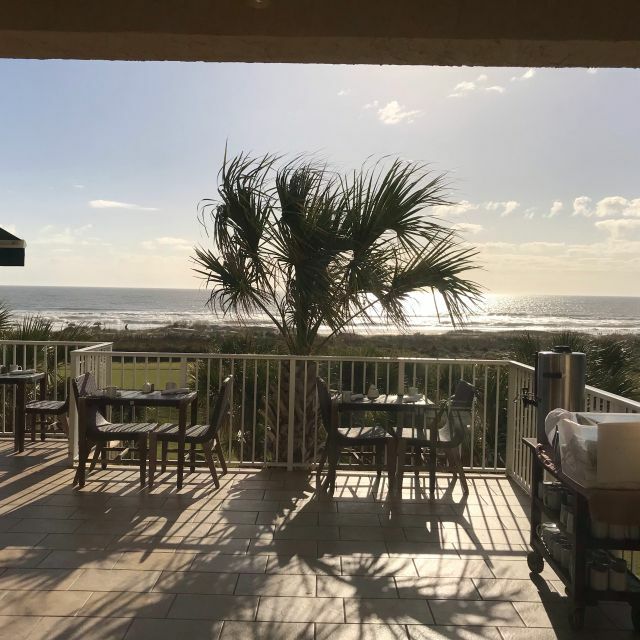 It’s hard to beat an oceanfront view paired with a great breakfast! Poor service, didn’t even keep my coffee warm. And the place was empty, so it wasn’t as though they were overwhelmed with customers. Food on the buffet was cold and over cooked. Overpriced, bland food. Never got offered any water or drink besides my one cup of coffee. Had a hair in my grits. Overpriced food that wasn’t worth it. Save yourself the money & headache and avoid this place. We had an amazing birthday breakfast at the Sunrise Cafe. The food was delicious and the presentation superb. The wide variety of food choices made it easy for each person to get exactly what they wanted which made the price well worth it. Every person from the hostess to our server to the omelet chef went out of the way to wish our birthday girl a happy birthday. The head chef brought out a special treat and wished her a happy day as well. It was perfect and we will go back soon. WONDERFUL STAFF. EFFICIENT AND COURTEOUS. CONCERNED ABOUT OUR COMFORT. DISPLAYED GREAT TEAMWORK. THE FOOD WAS TERRIFIC. EXCELLENT SOUP . THE VARIETY WAS ENDLESS, OUT OF THIS WORLD DESSERTS ! A WONDERFUL PLACE FOR A CHRISTMAS BRUNCH. Third time we have had the Saturday brunch, but the grits and scrambled eggs were served cold. There has to be a better way to keep the food warm. Great variety of food. Disappointed in the hot served food. Lovely breakfast buffet! Fresh food every time and the displays are well done. Stayed at the Omni Resort Plantation for my birthday, my fiancé and I decided to try this place for breakfast we were both pleased. It was a little challenge to find signage would have definitely assisted significantly. The breakfast buffet was great and our server was amazing ! Everything was fantastic! The food was wonderful, and the service from Brittany was the best!! Best brunch that I have ever had. Such a wide array of offerings. The quiche was incredible. Ms. Donny's omelet was the best - more than that her warmth and kindness were amazing. The service was terrific - Leighton was our waiter, and he was fantastic, friendly, attentive, and informative. It can get a little hot out on the deck. It was me and my twin’s birthday, the waitress was so friendly and instantly made us feel special with fun beverages and a birthday desert! We had no idea the wait staff would sing for our birthday and it was a fun surprise! Sunrise Cafe will always be an enjoyable memory of our birthday. I would highly recommend Sunrise, beautiful view of the ocean while having a delicious meal. FYI. Reservations are not guaranteed. The hostess stated that they don’t honor/take reservations even though you can reserve on open table. Beautiful view, excellent food and service! My mom and I stopped in to have a late breakfast on our way home from Savannah. The restaurant was beautiful and so was the view! We sat at a table overlooking the ocean. Breakfast was delicious and so were the bottomless mimosas. Our waitress, Camoya, was sweet and accommodating. The whole experience was great and I will definitely be back! Great service and excellent food. Waitress was very attentive to our needs. Took my Mama to the Omni for a Mothers Day get away. The Brunch was wonderful!!!! Everything from a seafood raw bar to chicken & waffles!! So so delicious!!! Great service too!! I fell in love with Mrs. Donnie, the Omelet Cook. Everything you ever wanted in a breakfast. Donuts and glazed banana dish specially prepared by the chef for our occasion was a wonderful surprise. Outstanding service. Perfect ambiance. Perfect seating for watching God's sun rise over the Atlantic Ocean! We went for breakfast and although it was beautiful, the blinds are only for looks. They are not functional. Therefore, with the sun in our eyes, we had to eat breakfast with sunglasses on. In addition, the food was good but the pricing was a little ridiculous. I've had better food and paid way less. It was disappointing. Beautiful morning, beautiful view, and beautiful buffet! Enjoyed our anniversary with a special strawberry shortcake and mimosa! This restaurant is not pet friendly. Made a reservation stating we would need an outdoor pet friendly table for a 10lb Shih Tzu and when we arrived, we were told service pets only. They went ahead and acted like they were going to seat us (got us menus and checked us in) and then again said service pets only. We were wondering if they thought we were going to check our dog in somewhere like luggage. We drove there from 15 minutes away. I told him we would not be dining there without our dog who would just be lying in the bottom of our stroller. He said the restaurant is an extension of Omni. I take it that the Omni resort is not pet friendly. Unfortunate, we will not be staying at the Omni or dine at any of its restaurants. Sunday Brunch was a treat at Sunrise Cafe. It has a very welcoming feel and if you sit outside it has a great view of the beach. This restaurant is located inside the main building of the Conference Center, but has a beautiful setting very open and airy. The selection on the menu or going through the buffet are plentiful. We chose the buffet and weren't disappointed. 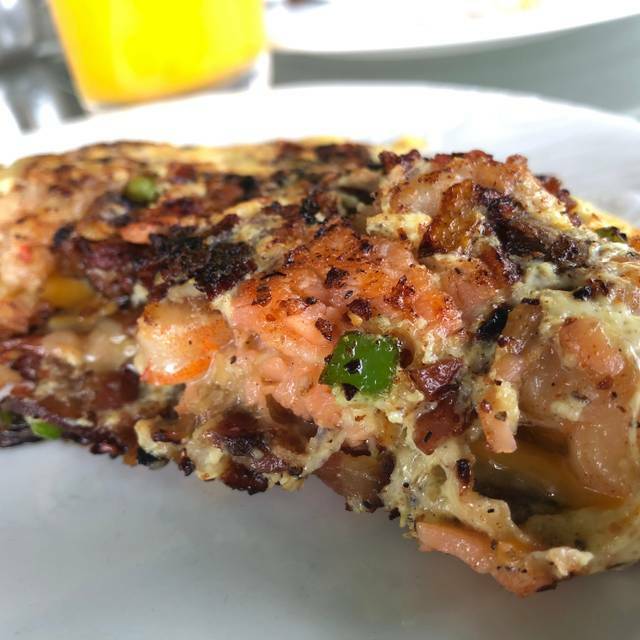 I had an omelet with shrimp, jalapeños and lots of veggies, this was a yummy omelet as you could taste everything in it, not to eggy. The display of the buffet was very eye pleasing and so many choices you certainly won't leave hungry. I could have breakfast everyday at the Sunrise with the food and the views! Excellent experience, varied and creative breakfast menu and buffet. We were quite impressed with the friendliness and teamwork of the staff - seems everyone working pitched in to check-on and service us and other guests dining. This was our 4th time for brunch - and maybe our last. Was not busy enough to keep hot/fresh food on the buffet. Outdoor dining was closed - not sure why. That's the reason we go - for the great outdoor view. Server was terrible - not attentive at all, didn't want to explain the fact you could also order menu items if getting the buffet, not too friendly - makes the experience more about herself than the guests. I'll never understand how that is acceptable service??? When done right this place is great, it's just too hit and miss. Servers need to be better. Manager did a good job handling a bad experience.